Deputy Commy. General Adams having been attached to the Turkish Contingent, D.C.G. Drake from this date will undertake the superintendence of the Shipping arrangements in which he will be assisted by D.A.C.G. Turner; 2 and he will be the Officer in charge of the local duties at Balaklava including the Depôt. June 28. Heavy rain in the morning. Louisa 3 came on shore from the ‘Hope’. We all dined on board the ‘Lion’. At night, Major Mackenzie 4 & Ross 5 Q.M.G. Dept. came to my house about lead for a Coffin for Lord Raglan who died at 8½ p.m. At 11 p.m. note from The Honle. Colonel A. Gordon 6 to Mr. Filder intimating it Martin got kicked by a horse in the Cavalry Camp. Lt. Gen. Simpson 7 Com. of Forces. July 3. Fine. Wrote to England. At 4 p.m. the remains of Lord Raglan were removed from Head Quarters to Kazatch Bay to be sent to England by H.M.S. Caradoc. Louisa & Miss Lu went. 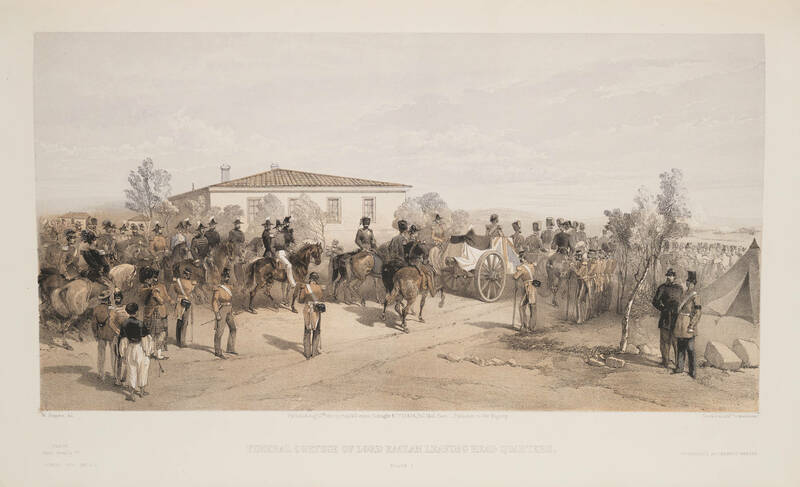 Funeral Cortege of Lord Raglan Leaving Head Quarters, by William Simpson. http://digitalcollections.smu.edu/cdm/ref/collection/eaa/id/1407, accessed 6 May 2015. July 4. Fine. Heard Genl. Simpson was appointed Commdr. of Forces. Faith arrd. July 6. Fine in the morning. At 1 p.m. heavy shower & very hot afterwards. Dr. Hadley 8 told me Mr. Filder had applied to him for a Medical Board. Wrote to Sir G. Maclean in reply to his of 3rd. July 10. Fine. Wrote home of Mr. Filder having it is said asked for a Mdl. Board. I bought 2 Horses of Ismael Pacha 9 for £32. Lundy retd. July 14. Very windy & dusty but cooler. I went on board Str. Assistance. Saw Rice 10 & Doherty. Wrote for Trowsers with Gold Cord & how to send Miss Lu’s habit by Hayter & Howell 52 Mark Lane. 11 Mr. F. applied for a Medical Board. July 18. Louisa’s birthday. 13 Weather cooler. Letter from England. Mr. Filder’s leave in Genl. Orders. July 20. Rode up to Head Quarters. Saw Lt. Genl. Simpson, M. Genl. Barnard 14 & Col. Steele 15 Mily. Secy. about Mr. Filder’s Board & the charge of the Dept. consequent on it. July 24. Very hot morning. Board of Survey on Fuel. Wrote to England. Thunder & Showers. Weather still hot. July 25. Hot sultry weather but cloudy and with showers. Thefts made by Joseph my servant reported. July 26. Joseph on being taken towards Police Station bolted. Receiver returned some of the things. At 5 p.m. Mr. Filder embarked per ‘Lion’.